"EPSON GENEVA SAVES SKIING TRIP"
Professor Rice has the responsibility for coordinating the integration of micro and mini computers into the accounting curriculum at Loyola College. The use of a computer is required in every undergraduate accounting course and students are urged to purchase their own portable or desk top computer at educational discount prices which can be financed through the College. I believe most teachers can appreciate the problems caused by last minute changes in teaching assignments. Unfortunately, my department chairman had to make such changes in mid-January, 1986 with the spring semester scheduled to start the last week of the month. I was asked to teach intermediate accounting and agreed to do so even though it had been eight years since I last taught the course. The preparation of a new syllabus seemed likely to interfere with a 10-day, cross-country skiing trip which my wife and I had been planning for nearly a year. As much as I dislike taking work on vacation, I decided to pack the textbook along with my computer and printer. This article is about how I was able to use my Epson Geneva portable computer to prepare and transmit the syllabus while on the trip. My course syllabi have a few pages of information about my teaching philosophy, grading policy, etc. The last page consists of about 50 lines identifying the 120 or so textbook problems assigned for the semester. In addition to the problem numbers, I also show due dates and estimated completion times for the problems. I was able to give my secretary the policies part of an old syllabus before I left so she could make the minor modifications necessary while I was away. The problem was that the last page with all the numbers on it had to be completely retyped after I made the very time-consuming problem selection. Before I departed, I considered the possibility of dictating the information for that page by telephone from the lodge. However, I knew that using voice communication with so many numbers involved would likely result in errors, especially since I would not get to proof the syllabus before it was reproduced. The only solution seemed to be electronic transmission. My wife and I have been vacationing in West Virginia state parks for nearly 20 years. Our favorite park has a rustic 40-room lodge in the middle of about 2,000 acres of state parkland. It is adjacent to an 850,000-acre national forest in the beautiful highland area of the state. The mountains there rise to over 3,200 feet. This, plus the fact that the average snowfall is 132 inches a year, makes it an ideal area for cross-country skiing. Five years ago when on a winter vacation at the park, we discovered that the state had set up a ski touring center and was starting to cater to cross-country skiers. Neither of us had ever done any type of skiing before, but we decided to take some lessons and try it. Both of us fell in love with the sport. We were able to enjoy the same hiking trails which we had enjoyed so many times in the summer, only this time on skis. Day trips on skis turned out to be even more fun for us than hiking the same trails in the other three seasons. In a word, we were hooked. Therefore, you can imagine our chagrin when it looked as if we would have to delay our trip a few days in order for me to prepare a syllabus. During our stay, we had two to three inches of new snow each night and the skiing conditions were fantastic. After skiing most of the day, we would have dinner at the lodge and then settle down in front of the six-foot fireplace in the great room. We took turns keeping wood on the roaring fire while my wife enjoyed reading and doing needlework and I worked on my syllabus. It took me five nights working about three hours each night to select the problems, plan due dates, enter the information into the Geneva, print it and proof it. It wasn't exactly romantic, but it sure beat delaying our trip for a few days. When the syllabus was completed, I used my Geneva to call the VAX mini computer on our campus and uploaded the information. After making sure that the transmission functioned properly by typing it to the screen, I gave the print command to send it to the laser printer in our Academic Computing Center. The whole process took no more than 20 minutes. The next morning as we were enjoying the snow, I skied up to a pay telephone at the deserted camp ground and, without removing my skis, called my secretary. I asked her to pick up the completed syllabus and have copies made for my class. I was still somewhat concerned about whether my efforts were going to be successful since this was the first time I had tried using the Geneva for anything quite this involved. I had my answer three days later when I opened my office door an hour before my first class. There on my desk was a neat stack of letter-perfect syllabi. It had been worth the effort. The Epson Geneva [Click the link to see a picture] weighs less than 5 pounds with its rechargeable battery. Its dimensions are approximately the same as for the Tandy Model 100. The 64K machine comes with 2 serial ports, MicroPro's Portable WordStar, Calc and Scheduler, Basic, CP/M Utilities and a communications program. All software is on 4 ROM cartridges which are inserted into 2 slots in the bottom of the unit. It has a built-in microcassette storage device. I have also purchased the optional 64K RAM disk (which functions as a hard disk) and 300 baud modem in a wedge which attaches to the bottom of the unit, as well as the 3 1/2" disk drive with rechargeable battery. However, I rarely take the disk drive on trips because the RAM disk and microcassette provide adequate storage for most applications. The screen has an 80 column, 8 line LCD display with easy access to 24 lines by scrolling backwards. The Geneva can be directly connected to an Apple or IBM PC for file transfer. There is also a special version of Ashton-Tate's dBase II available on ROM cartridge. 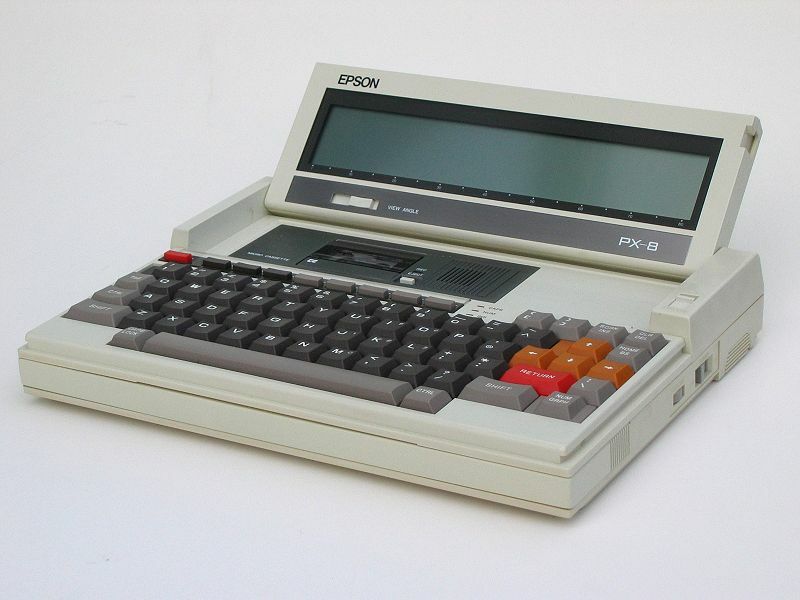 While this computer is no longer available from Epson dealers, it has recently been advertised by DAK Industries Incorporated which bought the remaining units from Epson. DAK's address is 8200 Remmet Avenue, Canoga Park, CA 91304. The telephone number is 1-800-423-2866. The price of the system is under $700  including [the RAM disk, modem and] a Seikosha dot matrix printer and is referred to in their advertising as a "Computer PT Boat". DAK also sponsors a Geneva Users Group bulletin board (313-538-6968) which features a number of public domain programs. CompuServe's Epson Personal Computing Forum (GO EPSON) also has Geneva programs and information available. My printer is an Ergo HUSH 80 thermal printer with rechargeable battery which I purchased by mail directly from Ergo Systems, Inc. at an educational discount price of $203. It weighs less than 2 pounds including the roll of paper inside and is about the size of a carton of cigarettes. Ergo's address is 303-3 Convention Way, Redwood City, CA 94063. I am obviously sold on the idea of educators using portable computers. Over the past three years I have used mine for a number of other academic applications while out of town. For example, I have used it to prepare a questionnaire for a research project and to prepare a spreadsheet template. I have used it on an airplane and in an automobile. In fact, I wrote most of this article while riding in a car as we drove 14 hours to Virginia and back on a trip to visit family and friends. If you don't get carsick, a portable computer can turn a time consuming trip into one of productivity. While my Geneva is not the only computer I use, it has certainly proven extremely helpful to me in doing my job as a college professor.